A charming 3 star hotel located just 3km south of Dublin City centre along the curve of Dublin Bay with beautiful views of sea and shore. 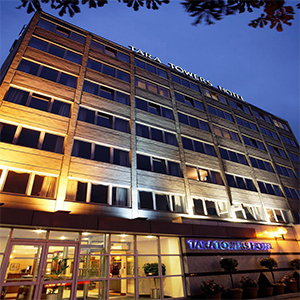 Tara Towers Hotel is located next to Elm Park Business Campus, Novartis, Allianz, Jacobs Engeering, OSG, and is walking distance to UCD, St Vincent's public and private Hospital, Blackrock Clinic and the RDS. Tara Towers Hotel offers a warm and welcoming atmosphere for those visiting the city either for business or on a Dublin City break . The hotel is ideal base for going exploring in the Wicklow Mountains and Glendalough all within hours drive away. The hotel is a short time drive away from Dublin's tourist attractions including Book of Kells, The Jameson Distillery, Christ Church Cathedral, The Chester Beatty Library and much more. Live music every Friday & Saturday night from 8pm is performed at the PJ Branagan's in Tara Towers Hotel, Dublin 4. The PJ Branagan's at Tara Towers bar, with its wooden floors and open fires is a homely place, where you can relax with friends or family, or enjoy a meal on your own with the newspaper. At this amazing Bar in Tara Towers Hotel Merrion Raod Dublin 4, freshly cooked Breakfast Lunch and Dinner Daily are served. In PJ Branagan's bar major sporting events are shown live on the large flat screens. The full bar serves both local and imported beers. The place is a great venue for after-work drinks and family celebrations. Ocras Restaurant at Tara Towers Hotel Merrion Raod Dublin 4, serving freshly cooked Breakfast Lunch and Dinner Daily. Ocras is a distinctive restaurant serving both traditional Irish cuisine and Mediterranean fare. We at the Tara Towers Hotel provide the perfect venue for any family celebration such as: Birthdays, Engagement parties, Weddings, Anniversaries, Christenings, Bar Mitzvahs, Cofirmations, Communions, Gatherings. The venue's skilled staff give exceptional service whether you are holding a private board meeting or traning course or a televised delegate conference. Click to view more! Rooms at Tara Towers Hotel in Dublin 4 are spacious, comfortable, and airy. If you are staying on a leisure break, for business needs or visiting Blackrock Clinic or St Vincent's Teaching Hospital, our relaxed surroundings make it feel like a home away from home.